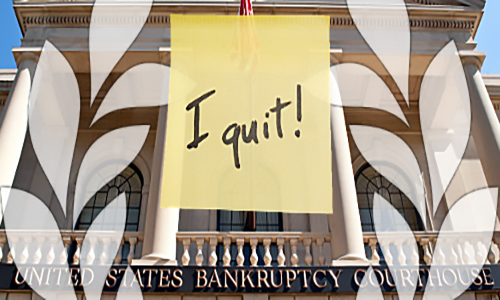 The ongoing court battle between Caesars Entertainment and a group of aggrieved debtholders regarding the Chapter 11 bankruptcy of the CEOC (Caesars Entertainment Operating Company) unit took a sideways turn on Friday, when the court-appointed mediator in the case abruptly resigned on Friday, citing “atypical” procedures purportedly being undertaken by the Illinois bankruptcy judge overseeing the case. In a letter written to counsel on both sides of the dispute, mediator Joseph J. Farnan, Jr., announced his resignation. In departing the case, Farnan took a clear shot at presiding judge A. Benjamin Goldgar, who last month ruled that Caesars must indeed face debtholder lawsuits brought by a group of aggrieved “second lien” CEOC debtholders. Farnan called out the unnamed Goldgar for what could be inferred as interference in the mediation process, despite the fact that the two sides remain billions of dollars apart. The aggrieved debtholder group, which filed multiple actions immediately after the January 2015 CEOC bankruptcy filing, has alleged fraud on the part of Caesars upper management and by primary Caesars equity holders Apollo Global Management LLC and TPG Capital. According to the debtholder actions, Caesars fraudulently moved most of the company’s non-profitable assets — the “bad Caesars” — into the CEOC holding entity, while moving the company’s better properties (the “good Caesars”) into other units. Farnan, appointed by Goldgar to mediate in the case, wrote that he believes Caesars has been “affected by atypical views” (presumably Goldgar’s) of a mediation process. I have decided to resign as mediator for the Caesar’s [sic] Chapter 11 bankruptcy case effective immediately. I have truly enjoyed working with the various constituencies involved with the effort of reorganizing the companies; however, recent events have convinced me that I am unable to continue the mediation process in accordance with standard mediation procedures I adhere to. This is not to fault or criticize those involved with the case. However, in my experience presiding over many complex Chapter 11 cases and mediating high profile Chapter 11 matters to successful conclusions, I believe Caesar’s effort at mediation is and has been affected by atypical views of a mediation process. For example, as I read the recent hearing transcripts and the Court’s August 26th bench ruling [in which the debtholders’ case was allowed to move forward], I was struck by the extent my Mediation Statement regarding the progress of the mediation — a standard report to a supervising Court — was the focus of the hearing and the Court’s observations. Apparently the Court did not find my progress report helpful because I didn’t breach the confidentiality of the mediation and testify in open court or describe the discussions and proposals exchanged, and detail the status of the differences among the parties. I believe the Court either misspoke or doesn’t understand how such disclosures would be viewed by participants and the markets. In any event, I am convinced that I can’t continue and possibly a new mediator will be able to establish a workable process. The testiness in the above is unmistakable, and carries with it a bit of “Who’s in Charge Here? ?” flavor — meaning the judge who’s trying to keep everything on an even keel or the mediator that’s trying to get things done behind the scenes. Part of the testiness in the above seems to be at the fact that it is, indeed, Goldgar in charge. But even without naming said judge, saying that “(he) doesn’t understand” is sure to make waves, along with reducing by one the number of future courts in which Farnan will be asked to mediate. And, though Farnan’s letter and resignation certainly represents a bit of a power struggle, it’s also a sign as to how intractable the whole CEOC bankuptcy situation remains. There just aren’t enough assets on the Caesars corporate table to please everyone with a stake, particularly if Apollo and TPG insist on retaining controlling ownership. How Farnan’s departure will affect the CEOC bankruptcy, in an ongoing legal sense, remains unclear. A mediator is an advisor, an unofficial (though important) element, yet the very public nature of the case now includes what will likely be seized upon as an example of judicial discord by whichever side comes out on the losing end. That translates to more appeals, more lawyers’ fees, and an ever-delayed resolution in the case.